This amazing scratch Oreo Cake recipe is the perfect combination of chocolate cake, ganache, and Oreo Buttercream! There’s just nothing better than this rich, homemade chocolate cake! 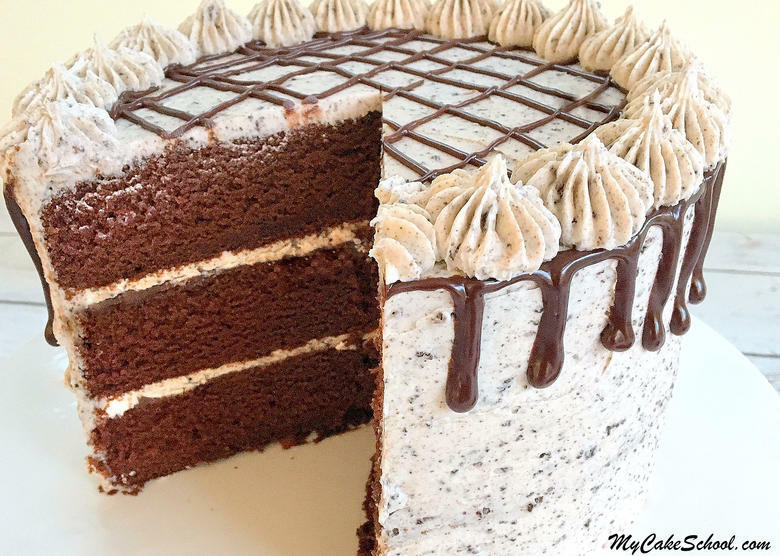 Moist chocolate layers are spread with a thin layer of decadent ganache, filled and frosted with a delicious speckled Oreo buttercream, and finished off with a ganache drizzle. SO good. Our Oreo Cake recipe (also known as Cookies & Cream Cake) is a combination of a few tried & true favorites from our Recipes section! Our Classic Chocolate Cake from Scratch is the only chocolate scratch recipe that you’ll ever need! It’s so moist, chocolatey, and bakes up nice and tall. If you’d prefer to make a doctored cake mix recipe, you cannot go wrong with this Chocolate Sour Cream Cake! Both of these recipes are crowd pleasers and work well with both buttercream & fondant. After baking and cooling the three chocolate layers, I piped a dam of buttercream and spread with a thin layer of ganache. 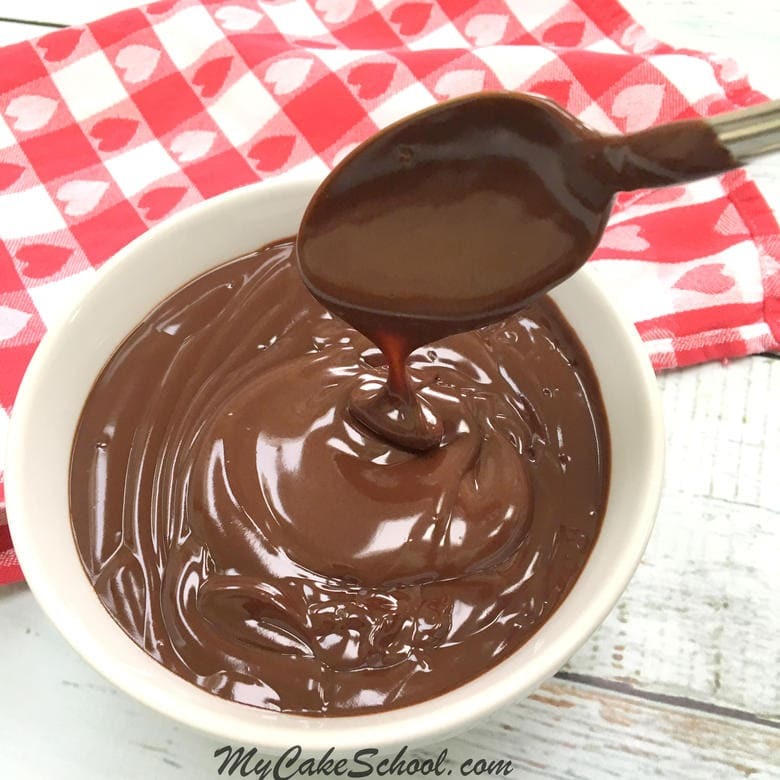 The ganache recipe that I used is a super simple recipe that can be whipped up in no time with the help of a microwave and equal parts chocolate and heavy cream. 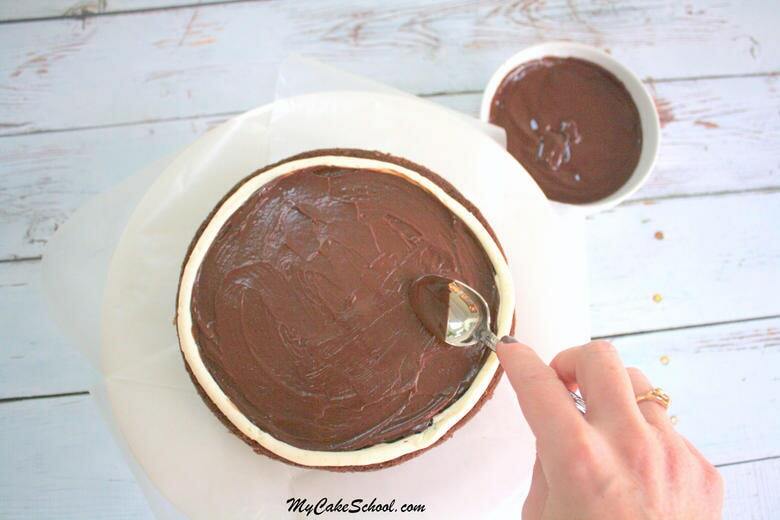 You can find all of the details for making an easy ganache here: Ganache Drip Recipe. It makes for a delicious, gorgeous chocolate glaze or drip! Here I am spreading a thin layer of ganache. 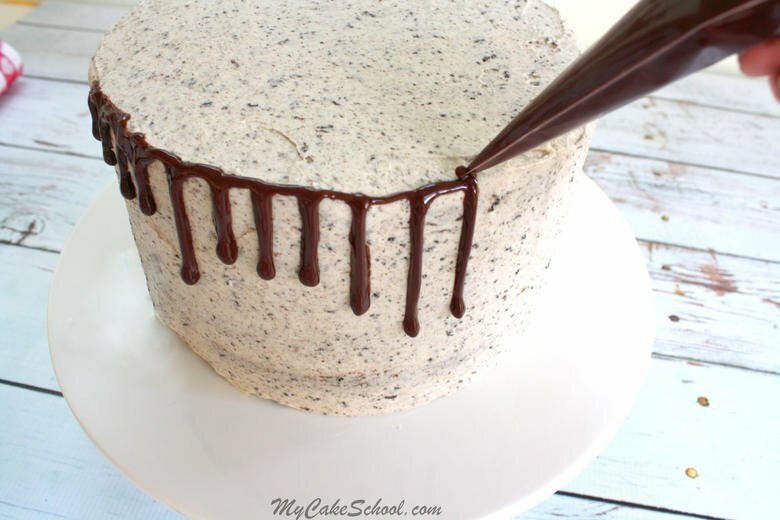 I spread my ganache nice and thin so that I would be able to easily spread a layer of Oreo Buttercream on top of it without a lot of sliding. Although I used a thin layer, the ganache delivers an unmistakable layer of richness to an already decadent cake. 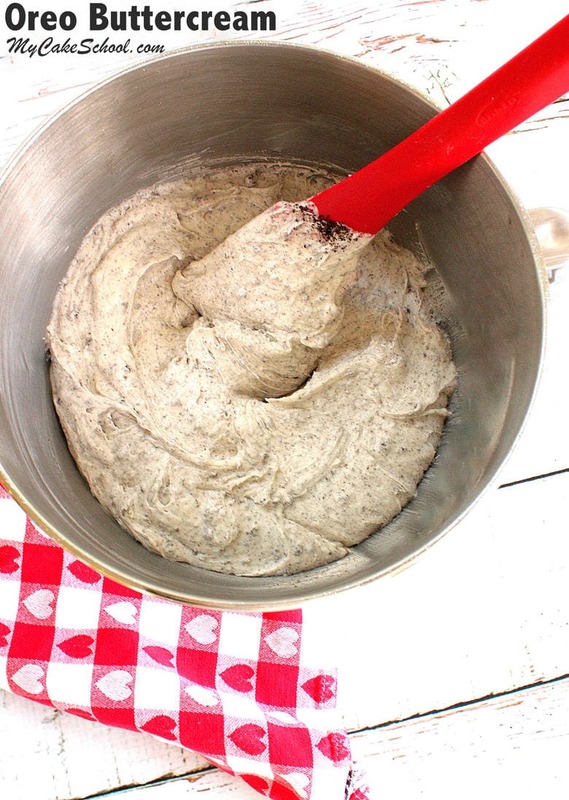 Finally, we finished things off with our fabulous Oreo Buttercream Recipe! This is similar to our Classic Vanilla Buttercream recipe, but with finely crushed Oreos! YUM! As I assembled the cake, I spread Oreo Buttercream filling over the thin layer of ganache between layers. I then frosted the cake with the Oreo Buttercream and dripped ganache around the top edge using a piping bag with the end snipped away. The ganache drips most easily when it is just slightly warm. It thickens as it cools and so if it becomes too thick to work with, just pop it in the microwave for 5-10 second increments until it flows easily from the piping bag. I love ganache drips! So dramatic! I continued to drizzle the ganache over the top of the Oreo Cake and finished things off with a french tip border (Ateco 863)! Because our Oreos were so finely crushed in a food processor, the frosting was very easy to spread and pipe. I just love the look and more importantly the flavor of this Oreo Cake recipe!! I think that it will become one of your favorites too! 7 cups (690-805 grams) powdered sugar (depending on desired consistency. More sugar=more crusting). If you prefer a frosting that crusts less, see our note at the bottom of the recipe. 1/2 teaspoon salt (3g) to cut the sweetness (preferably fine grain or popcorn salt). Adjust to taste. Oreos- We used about 10 crushed Oreos for this recipe but use however many you'd like! Method is important when using the Reverse Creaming Method. With the mixer on low speed, SLOWLY add approximately 1/2 of the egg mixture to the dry ingredients. Increase the speed to medium and mix for 1 1/2 minutes at medium speed. Don't mix above medium speed. Scrape the bottom and sides of bowl. Add the remaining egg mixture in 2 pourings, beating for 20 seconds after each pour. Scrape the sides and bottom of bowl. Place your chocolate into a microwave safe bowl. Pour heavy cream over the chocolate and place in the microwave for 1 minute. (Times may vary, see our note below). Remove and stir. Microwave for 30 seconds more and when the chocolate has melted almost completely, allow it to sit for 1 minute more before stirring. Stir until you've reached a silky smooth consistency. *Microwave times may vary. If you are making a smaller amount of ganache, you will reduce the microwave time. If your chocolate hasn't melted after the 1 1/2 minutes recommended in the instructions, simply microwave in small 10-15 second increments until it has nearly completely melted. Let sit one minute, then stir until smooth. Cream the (slightly softened) butter until smooth. Blend in the vanilla. Add half of the powdered sugar and most of the milk. Beat at medium speed until the powdered sugar is incorporated. Add remaining powdered sugar and milk and mix at medium speed another 3 to 4 minutes scraping the sides of the bowl occasionally. I slow down the mixer to very slow. (#2 on the Kitchenaid) for 1 to 2 minutes. This will help eliminate air pockets in the buttercream. The texture will become very smooth. Crush the Oreos. We used a food processor for a finer crumb so that the frosting would spread more easily. You can also place them in a Ziplock bag and crush with a rolling pin. Fold Oreos into your buttercream. Yields approximately 4 1/2 cups of frosting. Enough to frost a two layer 8 or 9 inch cake. Can be frozen in air tight container for at least three months . Thaw on countertop. If your buttercream is too thin, add more sugar. If the consistency is too thick, add a bit more milk. **For a Softer Buttercream with a much lighter crust, I cut the amount of sugar from 6 cups to 4 cups, and cut the milk from 1/4 cup to 3 tablespoons, and cut the salt to 1/4 teaspoon. This lighter consistency of buttercream works great with cupcakes or cakes that don't require the Viva method of smoothing. As you assemble the cake, pipe a dam of buttercream around each layer and fill in with a thin layer of ganache. Then, spread Oreo Buttercream over the thin layer of ganache for your filling. Frost the cake with Oreo Buttercream, and garnish with a ganache drizzle using a disposable piping bag with the tip snipped away. I drizzled a crisscross design over the top and piped a ring of Oreo Buttercream stars around the top using an Ateco 863. Don’t miss our full collection of favorite frosting and cake recipes in our Recipes Section! Also, if you’re interested in learning fun and simple cake decorating techniques, check our our Free Cake Tutorials Section! Thanks for stopping by! 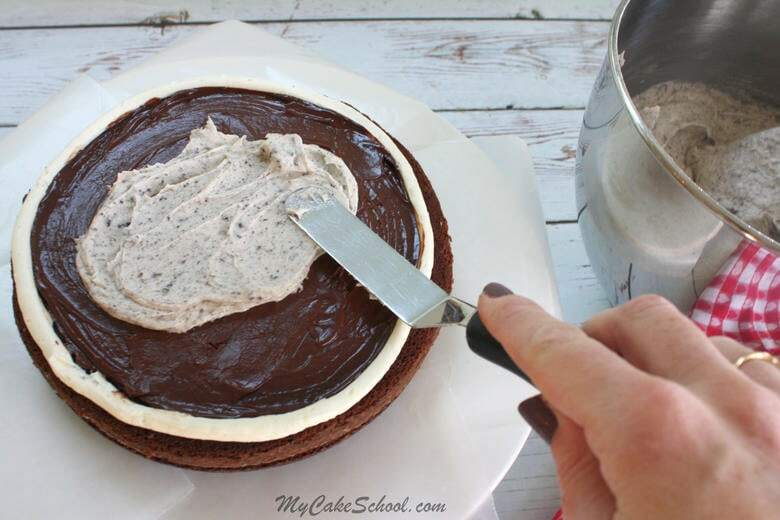 We hope that you make this fabulous Oreo Cake soon. I think that you are going to LOVE it! Hi Megan, I am so happy you like the recipe, thanks so much for posting a review.